The most obvious comparison is Foundry Inspector. 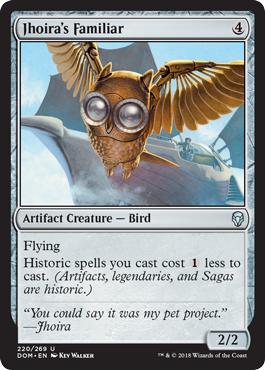 This card costs 1 more, but has flying to fly over ground creatures to attack planeswalkers. Can also trade with Delver. Con is that it can't be cast off of turn 1 workshop and has 1 less power. Who needs Workshop when all your cards are free? I'm torn. Flying and Inspecting are such important card attributes for the current breed of Mishra's Workshop decks, yet Lodestone Golem is being cut from lists for being too costly (among other reasons). I can't make a reasonable analysis until I've ran the card through a league or two. I still don’t understand what is “historic” about 99% of artifacts, but that’s beside the point I guess. I think this card has a chance since it has evasion, but it still has to compete against so many cards. Inspector costing 3 is a huge deal as it can lead to explosive starts on turn 1, which is nigh impossible for this guy. My theory is that because artifacts were initially created by the Thran, an ancient super race, all artifacts are considered historic. For example, Misha and Urza learned a lot from their archeological studies of Thran artifacts. Jhoira's Familiar looks mana expensive, as many suggested already. But why not? I remember when Lion's Eye Diamond was considered the worst rare, if not the worst card. And look who is on the Restricted list now.